I am not a fan of coats. They are big and bulky and uncomfortable to wear in the car. They are warm though, and when you're going to be outside, they can be a necessity. But if my outdoor time is limited (say I'm just running from the house to the car), I will skip a coat in favor of another layer to keep warm. Lately, that layer has been a plain black wool cape. Yes, a cape. Like Batgirl without the mask. 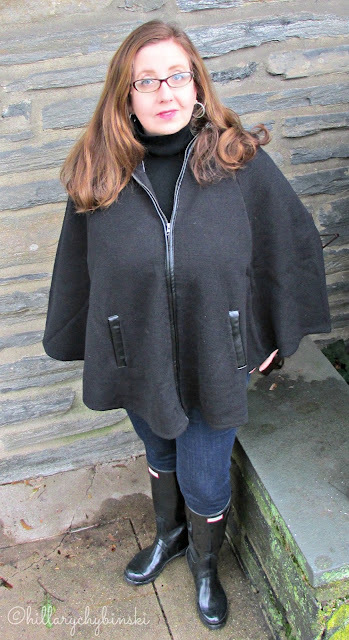 My mom gave me a great classic-cut black wool cape. It has leather trim around the pockets and zipper and has a stand-up knit collar. It's so easy to put on, adds a layer of warmth, and I feel tres chic when I wear it. When I was a little girl, my mom had a great black and white cape. It was the 70s and this cape was so cool. It was a black and white herringbone I think, with a red lining. She wore it whenever she went out, and I'm pretty sure it was her main coat when she was pregnant with my younger brother. Well capes, wraps and ponchos are popular right now for sure. You can find them at almost any price point (keep you eye out for upcoming sales), and in a variety of colors, prints and weights. They are a great topper to a dress or skirt, but look equally fabulous with a pair of jeans or cords. You can add a cute hat and some gloves to keep yourself even warmer if it's really chilly out. My only cape caution is to check the rear view. Make sure that your top isn't hanging out of the bottom of the cape in an unflattering manner. Unlike Edna Mode, I'm in full favor of capes. 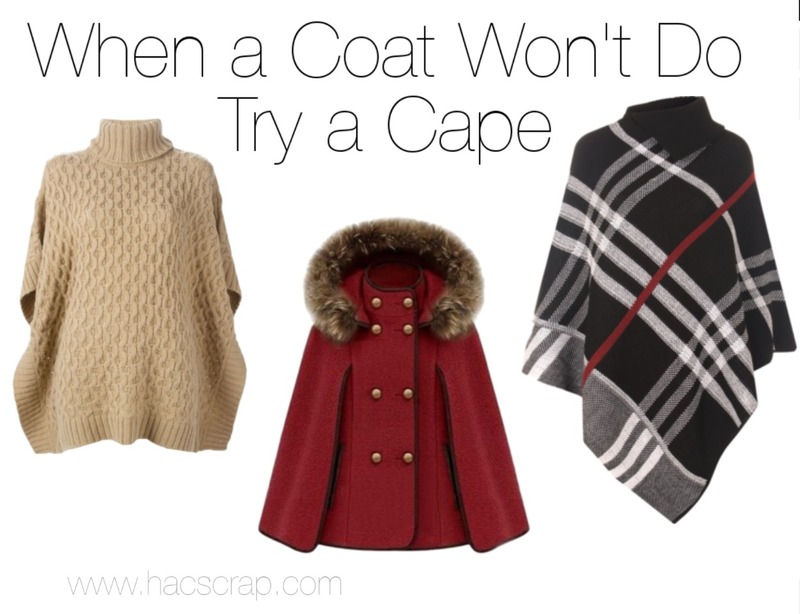 Do you have a cape in your wardrobe? This post is linked up with The Pleated Poppy and at Jo-Lynne Shane - be sure to check it out for even more outfit ideas and inspiration. 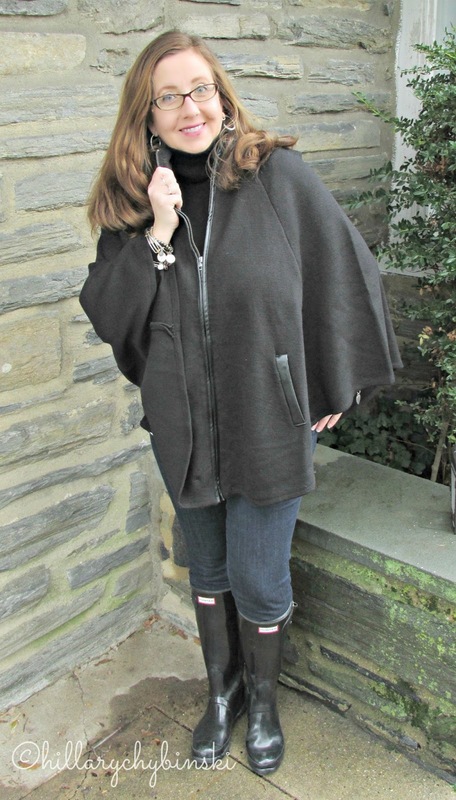 I adore capes! Sometimes it is hard to find one that doesn't overwhelm me, but I love them! I love capes. I have one that I wear all the time. The red cape is very pretty. I am looking for a sleek cape since three years. It is pretty tough when you are petite to find a cape that doesn't drown you., especially when you have hardly any body. Your cape has exactly the right proportions for your body and makes you look awesome. It is a prefect choice. Could you please link to the cape you are wearing? I looked on the Macy's website and didn't see it. Thanks! These are great! Looking for a new hockey mom look, I think I found it!